Where to pick, carve, and get your ghoul on this year. Halloween: generally speaking, it’s the only time of the year one can get away with dressing up in a costume, banging on strangers’ doors, and devouring half one’s weight in candy. God bless it. We want to ensure you make the most of this holiday, be it in a pumpkin patch, auditorium, or bar. Ergo, we have created this handy guide. Have fun. It does take a village, you know. The Flower Mound Pumpkin Patch. We know at least one magazine editor who still visits this pumpkin patch with her family every year. It’s that awesome. Bring the kids for a photo shoot, and stay for a hayride, Pumpkin Patch Train, hay bale maze, bounce house, pumpkin picking, and food sold by various vendors. The Great Pumpkin Festival. Many towns have a pumpkin patch this time of year, but Dallas has a whole pumpkin village. It’s a little insane, we admit, but it’s also pretty nifty. Each house in the Storybook Pumpkin Village represents a children’s book that features pumpkins. Nearby, you’ll find the Tom Thumb Pumpkin Patch, where you can buy your own gourd to take home and do with as you will. Pumpkin Carving Contest at The Libertine. Feeling a little stabby? Put that energy to good use at the Libertine Bar’s fourth annual pumpkin carving contest. Libertine supplies the gourds and knives, and you supply the artistry. First, second, and third place winners get $100, $50, and $25 bar tabs. Pumpkin Carving at The Old Monk. If you haven’t carved a pumpkin since grade school, we strongly encourage you to attend The Old Monk for its annual Pumpkin Carvings. From Oct. 20 until Halloween, you’re invited to carve your own masterpiece for just $10. You’ll receive the pumpkin, a carving kit, and a free pint of Guinness, Smithwicks, Harp, Black & Tan, or Half & Half. (Slightly different than the cookies and apple cider we were used to in grade school, but we’re not complaining.) For every pumpkin sold, The Old Monk will match the $10, and all proceeds will be donated to The North Texas Food Bank. Walk, Wag & Run.Who doesn’t get a kick out of dogs in costumes? Answer: no one we’re interested in knowing. This festival features 1K, 5K, and 10K races, a dog agility walk, a dog-owner look-alike contest, food and entertainment, and Halloween activities for the kids. All proceeds will benefit the YMCA at White Rock, For the Love of the Lake, and Friends of the White Rock Lake Dog Park. Growl-O-Ween. 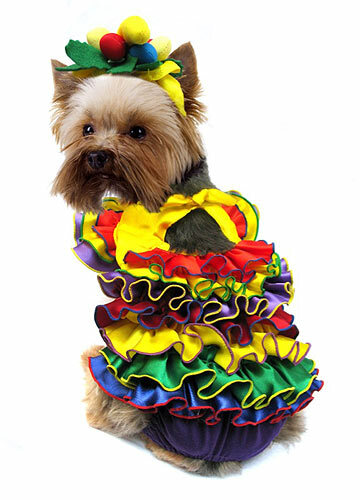 Because we simply can’t get enough of dogs in little outfits and assume you can’t, either, we’re bringing this party to your attention. Guests can enter their four-legged children in a costume contest (judged by radio host Victoria Snee of 102.9 FM and Amy Vandervoff of Good Morning Texas), have their pets photographed by a professional, participate in a raffle and silent auction, and more. Proceeds will benefit Lost Paws Pet Rescue. Halloween Nights at the Dallas Zoo. For four nights, the Dallas Zoo will close at 4 p.m. and reopen at 6 p.m. for an evening of Witch-ercize (led by a witch in a pointy hat, not your average sadistic aerobics instructor), “living trees,” a haunted carousel, a Monster Mash, and more. Kids are encouraged to wear their costumes, so long as they won’t interfere with camel rides and other activities. Hexter Howl Run and Carnival. This race offers participants two options. For the Dedicated Runner: a 5K that winds through the Old Lake Highlands neighborhood. 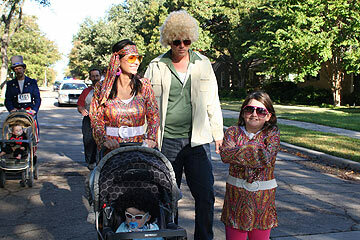 For the rest of us: a 1K fun run/walk that also includes a costume contest. After you’ve crossed the finish line, you might want to check out the carnival for food (sausage on a stick, anyone? ), a rock-climbing wall, and other attractions. Proceeds benefit Hexter Elementary School, which hopes to raise enough money to buy six iPod Touch devices and docking stations for its third- and fifth-grade classrooms. Halloween Dress Rehearsal Party. When were kids, we always lamented the fact that we only got to wear our Halloween costume that one night. Thank heavens your kids don’t have to suffer the same fate. The Disney Store is inviting youngsters to come by (dressed up, of course) for games, fun, and a costume parade. Kids ages 3 and up wearing a costume will receive a free gift. DSO Plays Psycho. Alfred Hitchcock’s Psycho on the big screen? Accompanied live by the Dallas Symphony Orchestra playing Bernard Herrmann’s classic score? Just before Halloween? Yes, please. Hitchcocktober at Mockingbird Station. For some people, Halloween is but one day a year. For us, it’s a holiday season unto itself. Apparently the good folks at the Angelika Film Center Dallas agree. Each Thursday in October, guests can watch spooky movies outside on the mezzanine. Some seating will be available, but you’re invited to bring your own lawn chairs or blankets. Ghostbusters and Beetlejuice at the Turner House. If you ask us, Ghostbusters is among the best American movies ever made. And it is possible that we can (and do) recite the entire dialogue from memory when the opportunity arises, much to the delight of our companions. We also love Beetlejuice, if for no other reason than because of that scene where the title character forces Otho, played by the late Glenn Shadix, to wear that hideous leisure suit. You can imagine how thoroughly stoked we were to learn that the Turner House in historic Oak Cliff has scheduled outdoor screenings of these cinematic gems. Drinks and snacks will be for sale. Fall Block Party at One Arts Plaza. While it might be tempting to spend Halloween mindlessly shoving candy into your face, pining for the days of youth, here’s a less self-destructive plan: head to One Arts Plaza for a day of cooking demonstrations, art exhibits, farmers market vendor booths, and live music. Cirque Du Horror. This show warmly embraces one simple truth: most of us never really outgrow Halloween. Artists and musicians from the Dallas-Fort Worth area will recite scary poems and short stories and play spooky music (we hope to hear a theremin at some point in the concert). Carnival of Souls: Purgatorium. This is the world premiere for writer and director Bill Fountain’s latest piece, presented by Level Ground Arts. Critics have called the acting group, still in its relative infancy, “ambitious,” “low-budget,” and “strange,” so we really have no idea what to expect with this one—and that’s part of the fun. Also, note the special midnight shows at the end of October. Undermain Reads: ‘The Golem.’ Anyone who thinks poetry is for sissies clearly hasn’t read “The Golem” by H. Leivick. Consisting of eight scenes, this piece tells the legend of a 16th-century rabbi who creates a giant clay figure to defend his people from attack–and ends up regretting it when the creature becomes animated and excessively violent. This reading, directed by Undermain Theatre’s Katherine Owens, will feature Fred Curchack as the Maharal of Prague and Bruce DuBose as the Golem. 2nd Annual Halloween Under the Stars at Aura. Aura and Post Properties are joining forces this Halloween to throw one gigantic bash – which involves transforming Aura into a haunted house. More than 2,000 people attended last year’s event, so if claustrophobia really does spook you, then maybe put this one on the back burner. But if not, prepare yourself for a 60-foot “haunted” outdoor tent, two DJs, one celebrity host, and food and complimentary drink tickets from 8 to 10 p.m. Oh, and we can’t forget to mention the $5,000 costume contest. So dress wisely (read: scarily). 5th Annual Uptown Halloween Costume Party at Trece. Charles Mann, Josh Vahrenkamp, and Jim Brady are hosting their 5th Annual Uptown Halloween Costume Party. Not sure who they are? We’re not either, but apparently they throw one heck of a party. Last year’s was at Sambuca, and the crowd outgrew the venue pretty quickly. So this year, it’s at Trece. And they’re even attaching a “haunted tent” to accommodate the larger group. Costumes are encouraged. Valet will be available, but cabs are recommended. Boo Bash 2010. If you’re looking for a place to dress up, party, and eat raw fish on Halloween, RA Sushi has you covered. This event will feature Boo Bites, Potent Potions, dancing, and a fortune teller (“you will meet a short, round California roll). The guests with the best costume will receive a $100 gift certificate, and patrons will receive other prizes throughout the night. Halloween at The Alcove. The Alcove is approaching Halloween ever so politely. Costumes aren’t required at their Halloween Bash, so if dressing up as a hot dog isn’t your thing, you can still go out and have a good time. But we do feel obligated to inform you that they will be giving away prizes for the best costume and for the most original, so you may want to rethink that whole hot dog embargo. Beer and wine specials are also part of the fun. Halloween at Blackfriar Club. If you’re bold enough to boogie down in the uncomfortable spandex that is your Halloween costume, then Blackfriar Pub is calling your name. They’ve booked a DJ for the spookiest night of the year, so get there early to claim your spot on the dance floor. Need some extra cash? Then put a little more time and effort into your duds: Best Costume wins $150 and Best Group Costume wins a $100 gift card. Halloween at Hacienda on Henderson. Hacienda on Henderson invites you to celebrate Halloween as they host a two-day frightening affair. From 7 to 11 p.m. on Saturday, they’ll be rewarding the best costumes with $50 gift cards every hour. When the clock strikes midnight, the most creative costume wins a $100 gift card. They’ll also be throwing around $3 fireball shots all night. Sunday marks their Dia de los Muertos Fiesta, staying true to Mexican tradition. The party starts at 9 pm, complete with a DJ, costume contest, and $3 espolon shots all night. Halloween at Idle Rich Pub. Feel like boozing and dancing instead of tricking and treating this year? Head to Idle Rich Pub, where the DJ starts spinning the Monster Mash (kidding) at 9 p.m. Don’t forget your costume: Best Costume wins $150, and Best Group Costume wins a $100 gift card. Halloween Masquerade. Aura is kicking off Halloween 2010 with a Thursday night masquerade. Grammy-nominated producer/DJ Carmen Rizzo, who has worked with the likes of Seal, Coldplay, and Alanis Morissette, will be on the turn tables all night. We were warned that this monster mash caters especially to music lovers, so wear your dancing shoes. Costumes are strongly encouraged, and bottle service is available. Halloween at The Old Monk. The Old Monk loves Halloween so much that they’re celebrating both nights of the weekend. The DJ starts at 9 p.m. on Saturday and 10 p.m. on Sunday. Costume contests are held both nights, so prepare to pull out all the stops if you want to reap the rewards. Best Costume receives $150, and the Best Group Costume wins a $100 gift card. Halloween at Renfield’s Corner. Renfield’s Corner is hosting two nights worth of partying for Halloween 2010. Saturday will have you dancing all night to the tunes of a DJ. (Yes, we’re pretty sure you can count on “Thriller” making an appearance.) And Sunday yields a performance by a live band, which is still yet to be determined. Either night is sure to entertain, and both nights welcome your most creative costume. Don’t be conservative. Prizes will be given away: Best Costume wins $150 and Best Group Costume wins a $100 gift card. Halloween at Three Sheets. Three Sheets invites you to come early and stay late for Halloween 2010. Dress in your “scariest best,” as a costume contest is in order. The freakiest ghoul or goblin (or Gaga, if we’re going with the odds) wins $1,000. Happy hour drink specials and complimentary valet are offered until 8 p.m, and $5 Three Olives Halloween Treats are available all night. Heaven and Helloween. This annual Halloween party routinely draws crowds of 1,000 or more, so you’re going to have to try extra hard to find an original costume. Guests will enjoy drink specials, bottle service, music by DJ Michael Greenspan, and an extra hour of partying given the time change. Monster Ball Halloween Bash at Joyce. Ladies, this party is for you. For starters, you get in for free until 11 p.m. if you’re donning a costume. Second, you’re treated to free champagne, also until 11 p.m. But if you’re late to arrive – i.e. if your costume takes a little longer than expected to zip up – don’t worry. They’ll still be offering $5 domestics and wells in the basement all night. Monster Mash Halloween at Lotus. If there ever were a project to put all of your time and effort into, the Halloween costume contest at Lotus gets our vote. Its Monster Mash Halloween Party includes the usual dancing ghosts and goblins, but the costume contest winner gets a scary-awesome $1,000. At the risk of sounding obvious, this isn’t the time to skimp on creativity. Drink specials for $5 are also part of the fun. Murder Mystery Theatre. So it’s a few days late for Halloween, but we’re always in the mood for a little scandalous fun. Join the Iron Cactus for their Murder Mystery Theatre, complete with cocktails, dinner, and a show. The plot revolves around Big Daddy returning home for the holidays with his new bride, Honey. Turns out, the kids aren’t so fond of Honey, and apparently the holidays are always a good time for … a murder. Tarot Card Dinners. Looking for something Halloween-y to do that doesn’t involve dressing up or shoveling fistfuls of candy corn in your mouth (not that there’s anything wrong with that)? Consider celebrating All Souls Eve with a sinfully delicious, five-course dinner at Hotel St. Germain, which will be decorated for the occasion. After you’ve supped, learn what your future holds with a candlelit tarot card reading in the hotel’s library.